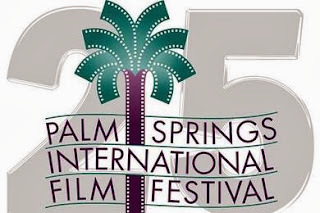 Friday kicks off the Palm Springs International Film Festival. Unfortunately I won't be able to jet down to sunnier skies this year. But I still want to bring as much info to folks who are lucky enough to make it. I've seen a number of films already and through the wizardry of the modern era have access to watch a ton more. While I'm not sure how much time I'll have to keep up this week I'll do my best to post thoughts as I see things. In the meantime here's a rundown on what I have seen and brief notes on each. Below are 8 capsule reviews. I've also seen The Grandmaster and The Great Passage. Each have something to recommend them but weren't in my top recommendations for 2013. The rest aren't in any particular order - so do read through if you'd like to get my fullest set of suggestions. A slow, absorbing and occasionally blackly comic meditation on life and the loneliness it can encompass. Oh, and death of course. Deeply touching in unique and occasionally shocking ways. 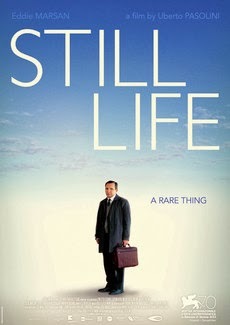 Of what I've seen so far at Palm Springs, Still Life is what I'd recommend most. A man's job is to search for family and friends of the deceased who don't seem to have anyone - in order to ensure their funeral is as complete as can be. He puts his back into his work, perhaps unconsciously recognizing that he himself is in such a high risk demographic. When budget cuts threaten his job he sets out to do right by one last unclaimed body. His Sherlock level detective work would make any police department proud, and maybe gives him back some joy in his own existence. What transpires is a short but very engaging piece of filmmaking that I suspect will be a hit at this years festival. From the festival description this film sounds like it's going to be a Caddyshack-esque comedy around a farmer obsessed with carp taking over the lake. Instead it's a slow meditation on the economic and social tensions between wealthy farmers and workers in Chile. So .... not really the same. It's actually the sort of slow burn where you expect something big and dramatic will happen close to the end. Thankfully there's a lot of fine cinematography to hold one's interest - for the most part. Overall this one actually went a bit too far on showing vs telling for my taste. Maybe more accurately not enough showing or telling. If you're looking for slow, moody to the point of borderline punishing and almost nothing but subtext then this one is for you. Didn't really grab me enough to recommend otherwise though. Judging by the song playing in the background as the film begins the ensuing story takes place in the land of the frozen trout. The description sounds light yet Hotell opens with a tragedy and many of the ensuing problems are brutally depressing. The woman at the center of the story joins a group therapy practice to deal with her loss. After their therapist goes on vacation a subset of the group decide to try their own escapist approach to self improvement. Namely checking into hotels and pretending to be anyone but themselves. It's a great setup, and there are a number of colorful characters and definitely some fun moments. Yet wouldn't say any of it is revelatory cinema and it's pretty definitely not really black comedy. I know, I know .... you loved Adam's Apple and it's roughly the same part of the world. Trust me, not the same. Kidding aside it's OK, and some audiences will love it. For me the disconnect with the description got me off to a bad start from which it's possible I never fully recovered. It's hard to speak about Last Call without thinking about Almodovar. The quirky characters, the random stuff happening for no reason, the Spanish being spoken. It's all there - but in lesser amounts of awesomeness than his best work. But it's still significantly more enjoyable than his recent film and for that I'll bestow a mild recommend. A troubled production of Caligula cast with all the screwed up characters you'll find in any onscreen stage production. With comments such as "no ... I can't eat organic products. I need hormones, food additives and cable TV to be happy," put-downs such as "You're doing a show 'visit Mexico ... We won't kill you'," and violent Emo stalkers there are plenty of fun moments. I'm not sure it all tied together especially well but the ride is worth it. This one has been growing on me since seeing it in a way that suggests I'd like it even more on a second viewing. Though again to rag on the festival description - "madcap" isn't a word I'd use to describe it. You can checkout the trailer here. For some reason the festival has turned off embedding. A film where nothing much happens but a lot transpires. In Latvia's submission to the 2014 Oscars a boy living with his single but professionally successful mom gets himself in a mess of scrapes. Told from the youngster's perspective it's both a slice of life and coming of age tale as he struggles to understand the impact of untruthfulness and to build a more adult relationship with his mother. This one held my attention all the way through and I'd recommend checking it out. A docu-drama covering the plight of Filipino workers in Israel. Specifically around the deportation of their pre-school children. No real context is given for the "new" Israeli policy that the Israel born children of resident workers cannot stay with them - except that a new government enacted it in 2009. Even without dramatization it's hard not to see how such a policy, particularly one changed suddenly could be crushing to real humans. The film of course brings it to life more fully, though never really hit me like the ton of emotional bricks I was expecting. Maybe because a significant amount of the dialog feels simplistic and overly direct. Though what's lost there is gained back by slick and professional production values as the story is told from the perspectives of each of a mixed family of participants. The acting talent also feels better than the written material, especially the performance from the youngest member of the family, Joshua. Bottom line ... you could probably do worse than Transit, especially in getting a peek inside a culture you probably don't know much about, inside another foreign culture to most American audiences. Just don't expect it to be a deep, deep treatment of the subject. And if you're a cynic like me your identification with the characters may not be enough of a mind meld to pull you completely into tears-ville. Given the subject matter that's what I feel should've been happening at least halfway through the film. Vic + Flo Saw a Bear (Canada) - I've only seen Denis Cote films, Curling and Bestiarie. Both are uniquely different artistic works. I quite enjoyed Curling years back. Bestiare struck me less strongly but it still was an interesting piece. From these two examples I picture Cote's work as slow, methodical and hard hitting. The film is the story of a 60 something ex-convict, who after being paroled takes up residence in her uncle's small, countryside sugar shack along with her younger female lover. The pair go on with life, dealing with misaligned goals and a caravan of intruding characters. It's the sort of slow, uneventful but engaging flick I often enjoy. But the entire time I kept wondering what brought this into the Fantastic Fest family, which is where I originally experienced the film. Sure, there are hints to past decisions - some clearer than others. And characters are dealing with issues and pain from complex prior lives. So, lots to interpret and think about but I'm still not sure ... until a point where it becomes very, very clear how this film got selected for a genre festival. In addition to the fact that it's very good. May not be a hit for those looking for something fast and rushed or perhaps somewhat disturbing. But the slow complexity - depending on your view almost nothing happens onscreen OR a ton of everything is shown via actions, looks and minimal dialog - definitely worked for me. Family drama or political thriller? - I'll let you be the judge. Born of the legacy of WW-II when children of German soldiers and Norwegian women were taken away Two Lives turns this real life problem into something you'd find in a spy novel. I won't say anymore as the film is best experienced cold. I definitely liked it, Two Lives falls just a notch below my strong recommendation threshold. But I do think many Palm Springs attendees will really dig it.